The perfect solution for storing products of a medium size and weight. i-RACK Longspan is designed to store wide, bulky loads. 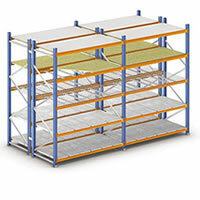 It bridges the storage gap between light-duty shelving and pallet racking. The range of applications can be from a single unit to a sophisticated multi-level picking system. With a high load bearing capacity, Euromech Longspan is ideal for an extensive range of storage applications.